For us, gold and silver are the most complicated assets to price. Stocks, currencies and other commodities mostly depend on fundamental data of the stock, the country or on physical demand and supply of the commodity. This what many call the “production/demand/inventory formula”. Once fundamental data about the asset comes out, even an inexperienced investor can understand most price movements. But for us, the production/demand/inventory formula does not really apply to gold. This because “gold is money” and therefore gold is far more subject to psychology, speculation and to what some may call “manipulation”. Instead, we think that gold and silver are valued somehow “indirectly”, it is a relative valuation and describe a “delta” between the US economy and the rest of the world. This makes trends driven by fundamentals very difficult to understand. Maybe therefore, gold and silver are far more subject to “love it or hate it”. Many analysts base their arguments to buy or sell gold on a limited set of fundamentals or only on technicals. Gold bugs often focus on the explosion of public debt and/or on real interest rates. With the falling gold price in 2013/2014, they got caught on the wrong foot and consequently they speak about conspiracy theories and market manipulation. But manipulation may happen in both directions….. This also implies that during a global recession, gold and silver prices are by far not at their highest point. Price movements of other commodities in combination with global demand for these commodities, an “indirect pricing” of production costs. Global and in particular U.S. inflation, often driven by rising money supply. Trade and growth imbalances against the U.S. and the resulting twin deficits, that might culminate in a “fear factor”. 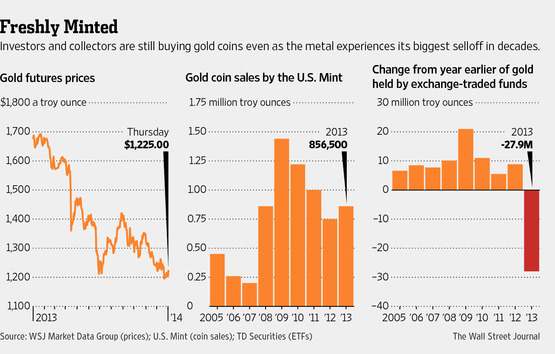 Central banks’ activities like money printing or gold purchases and sales. Real interest rates and in particular the ones in the U.S.: interest rates compared to inflation and wages, that might culminate in “financial repression”. The production/demand/inventory formula in the form of physical demand and supply. Gold and silver are positively correlated to other commodity prices. Cost factor: for gold dredging you need to move a lot of material or dig big holes in gold ore mining. Demand factor China: The global Brent oil benchmark and copper, in the last decade a proxy for Chinese investments, are closely linked. Both copper and oil got under pressure by the slowing of Chinese real estate investments. High Chinese interest rates and the regulation of Chinese housing, where the law disallows to buy a second home, helped to calm potential over-investments. Higher supply of U.S. oil and slower global growth weakened oil prices and consequently gold prices. The competition between OPEC supply and US shale oil further reduced oil prices. 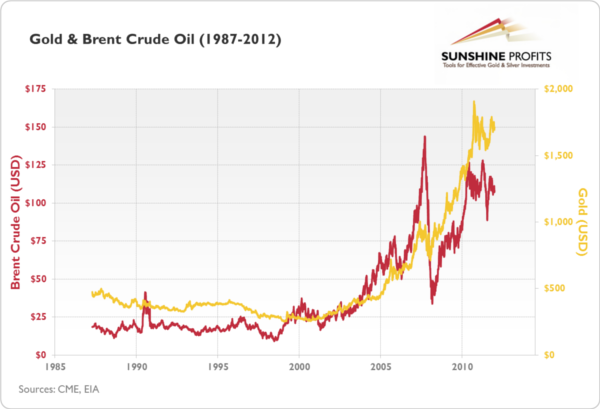 Cheaper commodity and oil prices negatively affected the gold price. 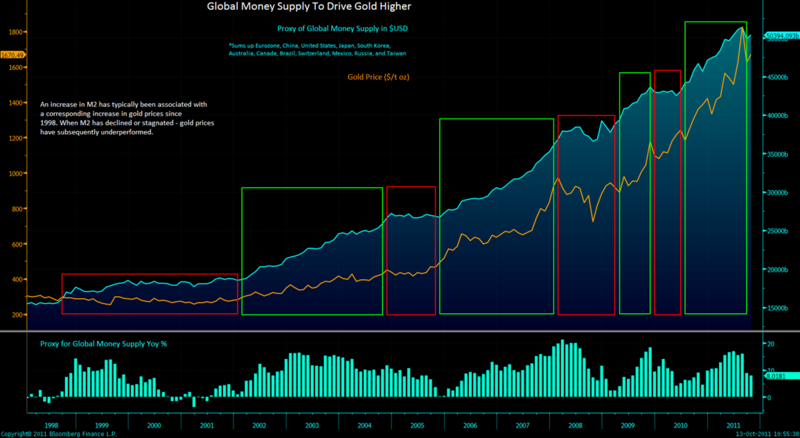 2) Gold and silver prices are correlated to global money supply and inflation. Metals appreciated until 2011 with rising money supply and inflation in emerging markets. Due to the high portion of food and energy in the CPI baskets of Emerging Markets, the effect of rising commodity prices on inflation is stronger than in developed nations. Since summer 2011, but also during the 2008/2009 recession, global inflation figures fell and consequently also gold and silver prices. More inflation leads to higher gold prices. The first view is the yearly increase of the CPI. 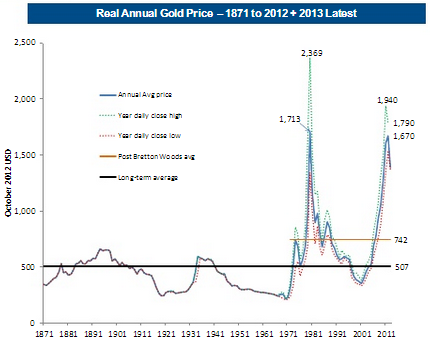 Here we observe the two spikes of the gold price in 1980 and 2011. The common view that the gold price is related to U.S. inflation is difficult to sustain in a world where emerging markets soon achieve half of global GDP. During the end 1970s “gold bubble”, however, U.S. inflation was the main driver of high gold prices (see more under point 5, real interest rates). Tight Chinese monetary policy with Central Bank lending rates of 6% limited locally-financed investments, while the end of U.S. tapering also indicated tightening. This limited inflows into Emerging Markets (EM) and available money in these former drivers of global growth. Falling food and energy prices in Europe are an indicator of weak EM. Tight monetary policy, no matter if in China or the U.S., is poison for the gold price. We realize that most US inflation is originated in rising rents and therefore in asset price inflation. This asset price inflation should slow down when finally wage earners are able to participate more in US growth and when long-term yields, e.g. for mortgage financing, rise. Still we agree with Fed member Kocherlakota that the inflation as measured by the US core PCE deflator will remain under the 2% target far longer than thought. Gold and silver typically rise together with economic improvements in emerging markets and Europe when the U.S. cannot cope with this pace. We explained that still today the euro has strong positive correlation to gold, they often move together: when the euro goes up, the gold appreciates. This third factor is the most important one, because it represents a “pre-indicator” for inflation (factor 2), central bank intervention in times of crises (factor 4), real interest rates/financial repression (factor 5) but also for the availability of easy money to push up commodity prices (factors 1 and 6). The growth difference between investment-driven growth in Emerging Markets and often consumption-driven growth in the U.S may lead to a “fear factor” incorporated in such “global imbalances”. The former often translates into high oil prices (factor 1) and fuels the fear factor so that US consumption may collapse like they did in 2008.. The Fed fights this fear factor with easy money. Between 2009 and summer 2011 emerging markets continued their ascent but high oil prices and the weak housing market hampered the United States. A similar situation happened in the 1970s when Southern America and Europe showed far higher growth rates than the U.S. While these global improvements helped the oil price, the U.S. trade deficit increased. This resulted indirectly in higher US debt. More debt implies a higher gold price. Either be invested in the local economy: investments in real estate or fixed assets boost commodity prices and via factor (1) the gold price. Or they must be exported with the financial account of the balance of payments, via capital outflows: Central banks in EM often hedge against inflation, more in point 4. German or Swiss companies, however, invest their trade surpluses world-wide. If capital outflows are smaller than the current account surpluses, then the currency is a “rare good”, it typically appreciates. When the yield of foreign investments is too low (see also factor 5), then surplus countries prefer to invest in the local economy, often in real estate. Finally these investments in the local economy may also be investments in human capital; hence wages rise. Recently rising wages and stronger real effective value of the yuan, have reduced the competitive Chinese advantage partially; the Chinese current account surplus has considerably weakened. Higher Chinese wages led to a run on the gold until 2011, but weakened competitiveness in the EM. Hence from 2012 on the United States has become stronger. Stronger investments and real estate prices in the U.S., however, tend to weaken the gold price. They raise expectations of a US interest rate hikes (see point 5). We explained that more private debt and more spending versus austerity in the rest of the world helps to raise US GDP. This indicates why the gold price was so low in 1999/2000. In that article we explain why more private debt in the US is initially bad for gold, because it raises GDP and hopes for higher real rates. 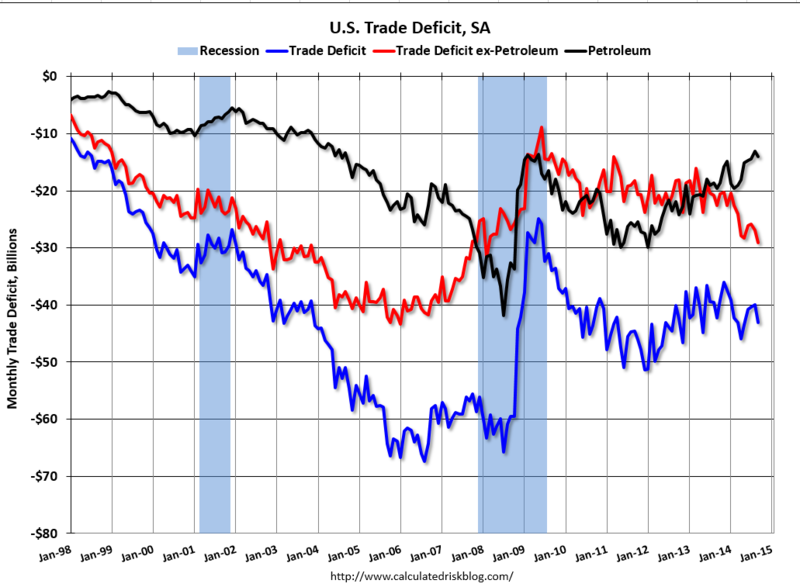 The U.S. trade deficit ex petroleum is strongly increasing and slowly approaching the records of 2006/2007 again. Trade and current accounts in Europe, in South Korean current account and the one of Japan, are strongly improving. 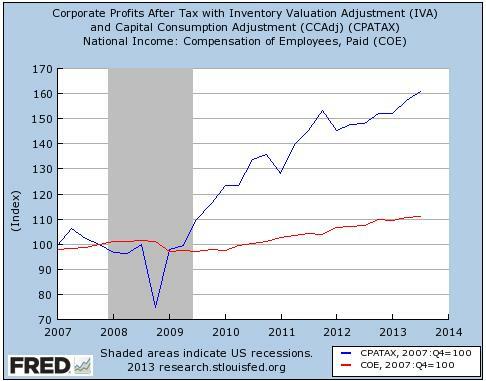 This reflects rising margins and rising cash of their companies as opposed to American ones. The non-petroleum deficit is strongly in favor of the surplus currencies euro, franc, Korean Wong and yen, but thanks to weak oil prices the market is still on the dollar bull path. Due to the divergence between falling petroleum deficit (factor 1) and rising non-petroleum deficit the situation for gold is mixed. The growth imbalance, however, narrowed. GDP growth strengthened in the U.S., while it slowed in Emerging Markets and Europe. This let to a decoupling of US debt and the gold price, a severe disappointment for many gold bugs. 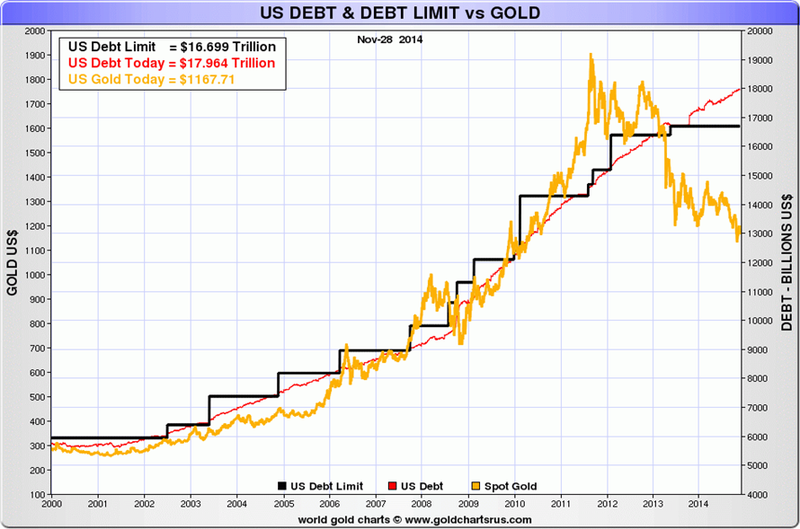 The empirical prove above that the gold is fully related to debt got rejected. For decades central banks in Europe and Emerging Markets (EM) relied on buying US treasuries or gold. The reason was that less developed countries have the potential of higher wage increases as compared to the richer Americans. Higher wages translated into inflation and the European or EM currency risked to depreciate. This could trigger again inflation, higher wage demands, more inflation, and finally potentially even hyper inflation. Hence holding U.S. treasuries or gold fulfilled a double advantage: the central bank had inflation-resistant reserves and could profit on an appreciation of the dollar or of gold. In the Bretton Woods system, all other countries fixed their N currencies against 1 currency, the US dollar. The Fed was obliged to exchange one ounce of gold into 35 US$. This created a so-called N:1 currency system. European central banks filled up their gold reserves in the Bretton Woods system, that until the mid 1960s was also a period of financial repression: Strong American GDP growth but low interest rates helped to reduce US and UK war debt. In the 1960s, however, gold became relatively cheap because U.S. inflation was high, while the gold-dollar exchange rate at 35$ per ounce remained stable. U.S. president Nixon closed this cheap gold window in 1971 that marked the start of flexible exchange rates. But with rising interest rates in the mid 1960s, central banks started to sell gold holdings and invested in income-yielding government bonds and cash holdings at other central banks instead (see also German Bundesbank interest rate history). Central Banks were selling gold between 1969 and 2009. With flexible exchange rates gold seemed to have lost its status for central banks. As the price of gold fell in the 1990s, central banks picked up the pace of their sales. The IMF demonetization of gold policy even urged central banks to sell their gold, countries like the UK and Switzerland followed these calls. Today the Fed is still the leading central bank in an implicit N:1 system of central banks, sometimes called “Bretton Woods 2”, because many central banks peg their currency against the dollar. But still today the Fed feels the need to fight a weak US economy within its double mandate of maintaining low inflation and reducing unemployment. The Fed often implements easing measures and expands its balance sheet. Typically gold prices rise and the US dollar weakens after quantitative easing (QE) executed by the Fed, because private investors and some central banks move out of the dollar into gold. Beware that QE executed by the Bank of Japan or the ECB, is negative for the gold price because it strengthens the dollar! Emerging Markets relied more on buying U.S. Treasuries because they started their ascent after the Bretton Woods 1 period when the gold price was already relatively expensive. During Bretton Woods2, some central banks (eg. in China) were obliged to revalue their currency against the dollar. This reduced the value of central bank assets, that consisted of USD-denominated assets. After 2008 US treasuries even yielded less than the high rates EM central banks had to pay on their deposits in order to prevent an overheating of their economies. To avoid a potential bankruptcy, they bought more and more gold that – as we know – as inversely related to the dollar. 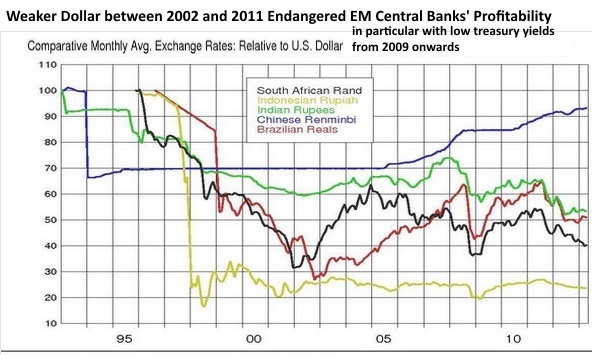 Between 2010 and 2012 more and more central banks in EM reduced their dollar share and bought gold instead. China holds 1.7% of reserves in gold, India 10%, Brazil only 0.5%. In particular, countries with current account deficits, like India (10% central bank gold holdings), Belarus (30%), Egypt (25%), often prefer gold to stabilize their currency, while Western central banks still stick with the former IMF rule not to buy gold any more. The gold share of EM central banks is still relatively low today, whereas it is very high for many European countries. The reason is that the central banks of Germany, France and Italy (all three with 72% gold holdings, see the full list of global gold holdings) could build up their reserves during the Bretton Woods era. 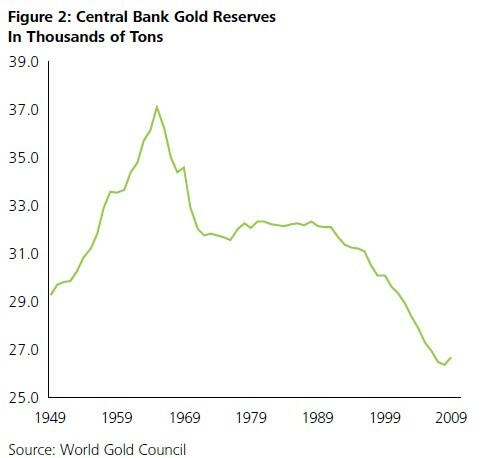 In 2012 gold purchases of central banks increased, while they were selling between 2001 and 2008. FX Reserves of Emerging Markets is Rising, but gold share is still low. When, however, U.S. unemployments falls, then the dollar appreciates and the Fed becomes more optimistic. Consequently money gets more tight and investors shun EM (see factor 2). Oil and commodities prices fall because investments in particular in EM become more expensive (see factor 1) and with lower oil prices the US trade deficits diminishes (see factor 3). Most central banks in the developed world are talking down their currencies, so the ECB, SNB, BOJ and finally also the BoE. It seems that the only central bank that might hike rates is the Fed. This strengthens the dollar and it weakens gold. Still today American funds, in particular the ones of the famous 1% are the most important driver of global markets. Therefore gold and silver prices fall when for these investors U.S. treasuries become more attractive relative to gold or silver. In times of high real interest rates, the gold price is weak and vice verse. The gold price falls when the U.S. economy improves and the chances of a Fed Funds rate hike increase, even if this hike is far in the future. Particularly when more U.S. jobs are created, then gold and silver prices decline. by item (2), when inflation rose more quickly than rates – between 1977 and 1980 (despite slightly positive real interest rates). During the 1970s, inflation expectations and consequently wages rose in response to oil shocks and rising oil prices. The gold price moved upwards together with wages and oil prices. The Fed chairman Volcker finally hiked interest rates so that unions stopped higher wage demands, new supply (e.g. North-sea oil) suppressed the oil price and the incomes of emerging markets. Global growth was sluggish. Consequently the Fed managed to keep inflation under control, company margins and stock price rose again: The Fed destroyed the gold price. Until the year 2013, the opposite picture arrived: U.S. wages had been nearly steady for years, but company margins were increasing. The wage share of GDP is declining, while companies could profit on global supply chains and cheap labor in emerging markets. Leading economists like Thomas Piketty and Paul Krugman, spoke out in favor of rising wages (and implicitly inflation). The chances of a Fed rate hike are increasing, partially in order to fight this new phase of irrational exuberance. In the introduction we argued that the “production/demand/inventory formula” has a lower influence on gold and silver prices. Price movements are now more reflected in modern instruments like ETFs and futures. ETFs made it possible that new investors were able to buy the metals more easily. With the resurgence of Asia after the crisis of 1998, gold and silver prices have seen a big bull run. One reason is that China and, even more, India have a strong gold and silver tradition and massively increased their physical purchases. The Indian savings rate is over 20%, a bigger part of savings move into gold. Silver has more industrial use, often in emerging markets. Silver reacts more strongly to physical supply and demand than gold. Other commodities, especially oil react very strongly to temporary disruptions of supply. This is not the case for gold: temporary disruptions like a strike of South African miners does not affect the price very strongly. In 2013, George Kesarios explained that gold prices may even move under production costs like they did in the 1990s, but he sees the production price around 1000 US$. Since then, however, the oil price has fallen further. Demand and supply for physical gold and silver diverted sharply. Why was the gold price so weak in 1999/2000? In our January 2014 post we explain that the Fed destroyed the gold price in the early 1980s, but now they will continue to be the biggest supporter of the gold price for years. Most recently Alan Greenspan took a similar position. For reference here our assessment of the six gold price drivers as of April 2013. It also includes more thoughts on the gold-silver relationship. There’s one major factor missing: MANIPULATION! watch this e.g. Weaker commodity prices, weaker China and other emerging markets, less inflation, higher US growth, rising US house prices. There are already quite a few fundamental explanations why the gold price has significantly weakened. Manipulation is always there, when stocks rise or fall, when gold rises or falls. But you cannot manipulate over the long-term. The most crucial factor is the “fear faktor”.you can’t explain the gold price without considering emotions.people buy gold to get their own financial fix point. This may be one of the greatest illusion but this is an other question. Demand manipulation growth are fundamentals but not necessarily the main factor . The fear factor, however, reflects the growth difference between investment-driven growth in Emerging Markets and often consumption-driven growth in the U.S. The former often translates into high oil prices and fuels the fear factor so that consumption may even collapse. are fiction or less relevants but convenient for the manipulators. Yes, the production/demand/inventory formula should be valid,as for any good. But this is apparently not the case. Currently many gold futures traders are short in “paper gold”. On the other side, the COMEX gold inventory is at lows. Some banks like JP Morgan are said to play an arbitrage game, short futures and long physical. They bet that these gold contracts lose their value. Gold is a pure psychological play. The commodity play related to making gold jewelry or circuit board components is a tiny percentage of overall utilization. Therefore, it is about fear. But only for awhile … but after the initial surge in gold and gold stocks … there was a fallback as we saw in the past few years. So, own early in a financial panic and sell as it crescendo’s …. Arnold, to make it concrete. Which of the 6 factors are valid for you? Quite solid study and reasons.very good research work. Thank you George. Have read your research note with great interest. Would be interested in reading your post from January 2014 in which you wrote how the Fed had destroyed gold but the link given in the Read also section seems to be broken. Any chance you could update it, please? Many thanks. I think in investing in gold, but I perceive some ethic issues with it. To buy gold and believe the price will go up it’s almost like to bet in wars, conflicts, deaths, etc. On the other hand, I understand that it’s unavoidable that the price of gold go up, given the majority of countries’ economies are based on Keynesian ideas, so the bubbles and busts are always latent. If I’m not mistaken, Mises predicted it, that after of the end of gold standard, the gold price would raise. Given these two factors, can someone explain to me why trading in gold is not unethical, mainly about the first point. Gold rates today in different cities are different the variation may be due to logistics, local charges etc. Gold rate variation in cities are generally low, there is an alternate way to buy gold through known sources where you will see gold rates across locations. To buy gold and believe the price will go up it’s almost like to bet in wars, conflicts. Thank you for sharing the wonderful article.